While that may be true, it’s a quick slip ‘twixt the cup and the lip, and poor health practices in any kitchen can easily kill, or make customers very sick. Every day, health bureaucrats are called in to investigate some food poisoning outbreak that could have been prevented. And this is where my focus today lies: on Andrew Thomson, our white knight, whose sole mission is to circumvent any preventable tragedies happening. While nursing might not be the normal career start of a food health and safety expert, it certainly was a great grounding for what became a huge career for Andrew Thomson. And the experience and training he received in Nursing and his further studies are put to good use every day. 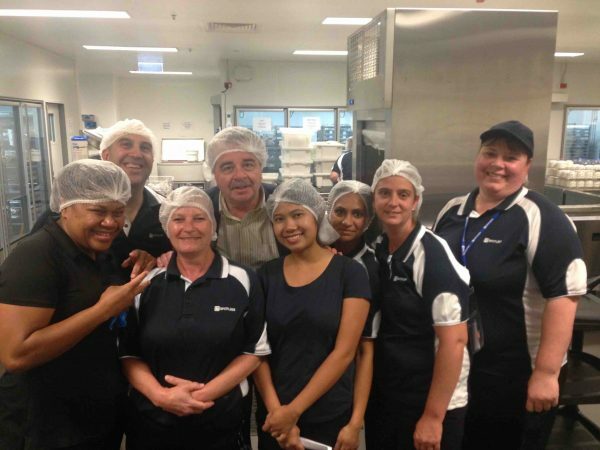 Andrew has been at the forefront of Workplace Health and Food Safetyacross the nation, developing guidelines, shaping the legislation, making sure that what is expected is doable, and achievable. When Andrew felt that nursing wasn’t quite his thing, and spreading his wings had finished an Environmental health Diploma in Adelaide, he applied and began work for the Hobart City Council, opening up collaborations with other agencies, working with businesses on improving food safety standards by taking an educative role, and was part of the first anti-smoking lobby. This group lobbied so well that Tasmania was the first state to outlaw smoking in public places in Australia. He worked with the Heart Foundation, and Sun Smart, developed and implemented a workplace health and safety initiative, looking after council employees, offering aerobics, discounts on gym memberships for people to release stress and get fit and healthy. His mantra? A healthy body = a healthy mind. We all take that for granted now, but Andrew was at the forefront of this push to make workplaces healthier by improving the health of the staff. Andrew became executive officer of a Departmental Committee called the Food Hygiene Advisory Committee. 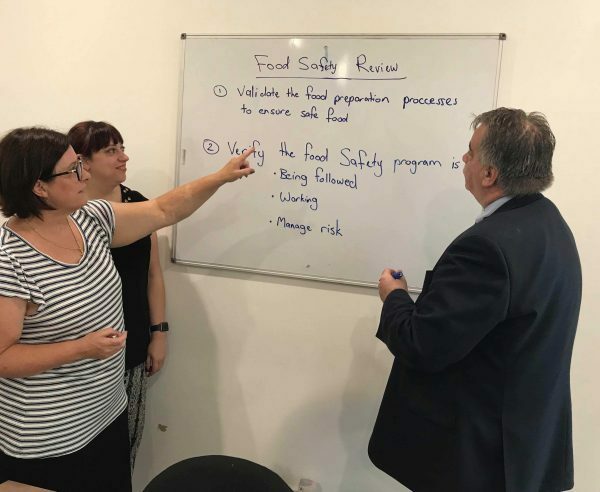 A few changes in Victoria needed to happen, so Andrew and his team developed codes of industry practice, which was quite innovative and Victoria was leading the way in food safety administration. He was involved in a conference for the food industry and regulators, working closely with Food Standards Australia New Zealand (national food regulator)and he was involved in a conference for the food industry and regulators and they rolled out the broad framework for food safety management in Australia. Andrew is passionate and driven about what he does, and while it may not seem life saving to some, to many chefs and customers, what he does is life-saving, and essential. Some interesting reading from articles he’s written is below. Have a look, and then see him if you need help. With anything. He’s there, for all of us. Another blog, Food Safety Training Must Be Top Priority For Restaurateurs is a great read and received worldwide attention. As far back as 1997, Winsome McCaughey AO, the former Chief Executive of Australia New Zealand Food Authority outlined the broad policy framework for food regulatory reform in Australia. The reforms promoted a risk-based approach to food safety management, which is consistent with international guidelines on risk analysis. Central to this approach was the introduction of national food safety standards. It shifts the focus towards prevention, rather than ensuring premises meet prescriptive standards, testing food already on sale, and reacting to outbreaks of foodborne illness. Food safety is an important public health issue. Risk taking by many food business owners and managers is prevalent throughout the broader Australian food industry as they are failing to comply with food law requirements. It seems every week there is a report of a food business being fined or issued with an infringement notice for failure to comply. Data from food prosecution registers and media reports across Australia supports this view. So, what are the risks and consequences? Small to medium sized food manufacturers and processors are deficient in food safety systems and procedures for recalling unsafe food and other documented business processes. Besides the risks associated within no compliance of food safety, a food business cannot innovate and become a market leader without first being in compliance with food law requirements. Food business owners and managers engaging in risk taking miss the opportunity to recognise the many business benefits. Cost reduction can be made by having a good food safety system, this should assist in preventing errors and reduces the need to repeat or re-work product or tasks. A business culture with a strong focus on compliance (and moving beyond minimum standards) can contribute to operational efficiency. Food handling employees can take greater ownership of compliance and this rubs off on everyone within the food business. Suppliers, customers and clients value working with a food business committed to achieving high standards of food safety. This builds trust and brand loyalty. What else can you do as a chef or owner/operator? Your food business will have a competitive advantage and can actively seek out new business opportunities. There will be a reduced number of inspections (and fees) by food regulators and you will not attract the attention of the media. Sixty three percent of all foodborne illness outbreaks in Australia occur in the food service sectors of restaurants and commercial caterers and in the related retail sectors of takeaways and bakeries (SA Health). In recent years, there have been numerous food safety incidents, which has had a major toll on health. Thousands of people fall ill and some may die as a result of eating unsafe food. These incidents have a significant impact on the food business and have wider economic costs that arise from loss of confidence in the safety of food. ▪ In 2013, one person died and another two hundred and twenty guests became ill after a salmonella outbreak linked to Melbourne Cup functions. Eight people had been hospitalised. Health authorities said the salmonella infection did not cause the death but may have contributed. ▪ In 2015, twenty eight diners had fallen ill and tested positive for salmonella poisoning after being served “unsafe” garlic mayonnaise used to accompany meals including fish and chips, burgers and pulled pork sandwiches. At the time, the business was facing thirty-two charges. ▪ In 2016, forty people fell ill with Salmonella food poisoning with eleven people stating they ate a chicken salad roll. Thirteen people were hospitalised. Media reports claim a pregnant woman required an emergency caesarean. ▪ In 2017, three salmonella outbreaks are under investigation in Queensland. They have been linked to more than thirty confirmed cases from raw or undercooked egg in Brisbane, while a further thirty-seven people were infected after consuming undercooked pork in Mount Isa. ▪ In 2017, an unclean Frankston restaurant was fined $30,000 for more than forty breaches of the Food Act, including threatening council environmental health officers. ▪ In 2017, a bakery selling unrefrigerated cannoli on a hot summer’s day led to forty-four cases of salmonella poisoning being reported to the local council health department. The bakery was fined $120,000 for various food safety breaches. These are typical incidents of which many of us hear about. It highlights that learning is more than reading information on a computer screen or engaging in animations, reading a manual or a text book and then answering a question. In its simplest form, learning involves knowledge and understanding (and retaining it), it also requires critical thinking and reflection and the ability to transfer knowledge to new and different situations or contexts or perform a task differently or in a better way. It’s time for many in the broader food industry to have systematic processes in place for employee training. One of the biggest problems in adopting this approach is the inability to determine if food handlers are consistently performing tasks in the manner that they were originally trained and whether they understand the reasoning behind these steps. This is especially important for employees working with high-risk food products. Doing business better often means taking a different approach than your competitors. Well performing food business owners and managers know what they want and they have a clear vision for achieving this; they share this vision with their employees. Their business displays a high level of consistency, reliability, accuracy and standards with their processes. They engage with their employees and provide focused training sessions to ensure they have the right skill mix to meet business, customer expectations and regulatory requirements. Employees know how to identify and resolve problems. The following three food-related business operations share a glimpse of their success within their respective industries. John McFadden, formerly the Executive Chef at the Park Royal Darling Harbour proudly announced at the time that the Hotel has been awarded, for the second year running, the Metropolitan Superior Hotel of the Year at the Tourism Accommodation Australia awards. Andrew will be a regular contributor, and has so much wisdom and insight into this critical area of restaurant and food management. Keep your eye out! Hope it’s of value.